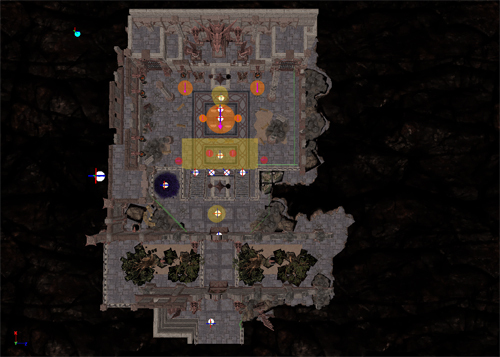 For each of the bosses in this game, we needed an arena that would contain the encounter. Below are some of the top down views of the first three bosses, along with some of the script and a short explanation of each. This section of pictures was for the encounters that lead up to the first boss. It was intended to be a winding path, with the players being attacked by swooping creatures. 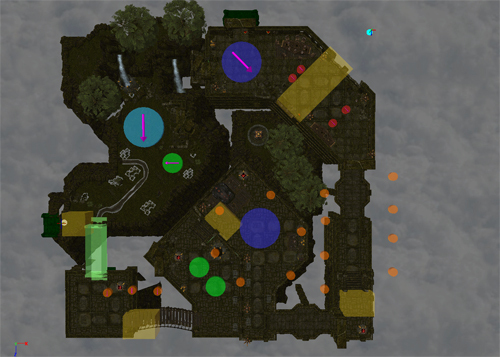 Contrary to thought, though, it was cool to see that the larger, more open areas lent themselves better to swooping type encounters. At first we thought that a gauntlet-style encounter while crossing a bridge or narrow hallway would be better, but the fun ended up being in the swarming behavior of our creatures in an area where the player could navigate to hit the creatures. 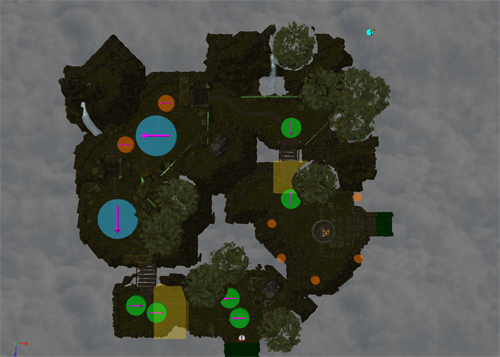 The level design then was informed by this discovery and so we had islands of game play connected by transition pieces. I created these levels to try to leverage the swooping encounter with creatures that led up to a version of the encounter, the boss fight, with a much larger version of the swooping creature. Each of the sections have basic scripting that allow the designers to gate content and control the number of creatures on screen. 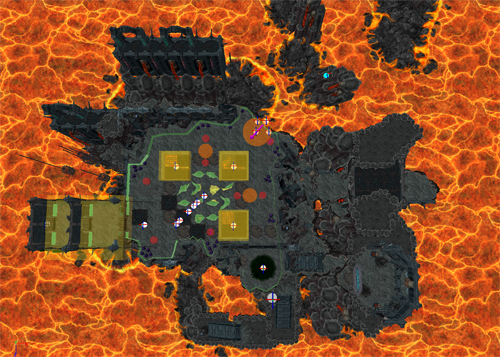 The final picture is of the boss arena itself, with the large open area accommodating the fight itself and being sealed of at the beginning of the encounter. The boss scripting was relatively straight-forward, calling for events to happen at different thresholds. In conjunction with our creature system, the scripting would allow the creature to change attack styles as it lost more health, or time elapsed, or other conditions were met. The second boss was the Barghest. This encounter ended up being fairly straight-forward, with the boss being able to summon adds, and spawning waves of creatures at certain thresholds. 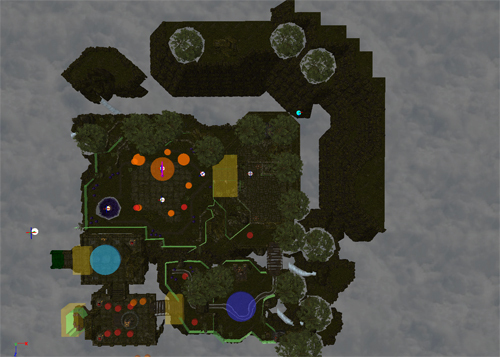 The fire pits also allowed the player to train attacking creatures over them to set them on fire and help manage the amount of damage that needed to be applied to keep the player from being overwhelmed.